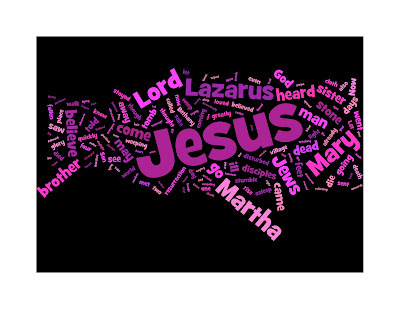 '...Now a certain man was ill, Lazarus of Bethany, the village of Mary and her sister Martha. Mary was the one who anointed the Lord with perfume and wiped his feet with her hair; her brother Lazarus was ill. So the sisters sent a message to Jesus, ‘Lord, he whom you love is ill.’ But when Jesus heard it, he said, ‘This illness does not lead to death; rather it is for God’s glory, so that the Son of God may be glorified through it.’ Accordingly, though Jesus loved Martha and her sister and Lazarus, after having heard that Lazarus was ill, he stayed two days longer in the place where he was. The story is well known to us and full of emotion. It is a very human story. As I re-read it this morning I realised that the heart of the story is not just the resurrection of Lazarus, or even that as a prefiguring of Jesus' own resurrection.